n this article we will provide an overview of the key trends in the use of mobile robots and drones in logistics and material handling. Here, we will define the scope very broadly, covering many steps in the chain of producing and delivering a product into the final customer’s hand. This article thus covers robots and drones in factories and warehouses, as well as in long-haul and last mile delivery. This exciting market will become a $75bn market by 2027. It will then more than double by 2038. These staggering headline figures mask turbulent transformative change underneath: some technologies will rise and transform the fortunes of industries, fuelling growth rates far outpacing recent trends, whilst others will face with decay and obsolesce. This article is drawn from our market research report “Mobile Robots and Drones in Material Handling and Logistics 2018-2038“. This report focuses on all aspects of mobile robotics in material handling and logistics. It considers automated guided vehicles and carts (AGVs and AGCs); autonomous mobile vehicles and carts/units; mobile picking robots; last mile delivery ground robots (droids) and drones; and autonomous trucks and light delivery vans (level 4 and level 5 automation). Automated guided vehicles and carts (AGV and AGC) have been in use since the 1950s. These AGV and AGCs follow a fixed guidance infrastructure such as conductive wire, magnetic tape or reflective strips. They act essentially as a distributed conveyer belt around industrial facilities. These systems are now technologically mature. They are also trusted and thus they can handle payloads ranging from a few kilograms all the way to many tonnes. The market is steady today, but the business landscape is fragmented. This may however be the calm before the storm. This is because this navigational technology is under threat from infrastructure-independent autonomous (vs. automated) mobile robots (AMR). This new approach offers increased flexibility and a lower installation time. They are still mainly (though not entirely) constrained to low to mid payload ranges since trust in their safety is still in the process of being built-up. These AMRs today only represent a small fraction of the AGV/AGV market. Despite all of this, our roadmap detailed in the report suggests that autonomous versions will become dominant, ultimately pushing traditional AGV/AGCs towards obsolesce. This process will start slowly from 2020 but will gather pace from 2025/2026 period. Indeed, we forecast that the annual market for traditional automated versions could halve within the next ten years. Short-, medium- as well as long-term market forecasts for mobile robots and drones in material handling and logistics. 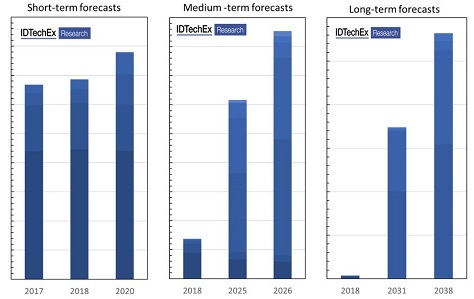 These charts show short term, medium term and long term forecasts for AGVs, AGCs, autonomous mobile industrial vehicles (forklifts, tugs, etc), automounts mobile carts, mobile picking robots, and last mile delivery robots and drones. Here in these charts we have excluded autonomous trucks and light vans for the sake of clarity but such forecasts are included in the report. For exact figures please refer to the report. Source: Mobile Robots and Drones in Material Handling and Logistics 2018-2038. The one major bright spot for automated systems remains in grid-based AGCs. These systems are proving popular in warehouses as they scramble to serve the needs of e-commerce. Here, fleets of automated carts follow regularly placed barcodes in a robot-only zone to rapidly shuttle special totes towards a picking station staffed by humans. These systems boost delivery time whilst enabling a more compact warehouse design. The business scene here is still hot after Amazon acquired Kiva and deployed its robots in its facilities. Numerous companies around the world including in India and China have emerged, raising notable funds and developing similar products to fill in the market gap. They are all aggressively targeting non-Amazon warehouse owners and operators. The hardware side looks similar across all suppliers and significant value appears to be in the inventory and fleet management software. This will continue to be a growing field. The advent of autonomous mobility will also change industrial/material handling vehicles. In particular, our report suggests that by 2038 as much as 70% of all forklifts will be autonomous. This, however, will get off to a slow start since costs of autonomy are still high and since customers are not yet accustomed to using remote fleet management tools. Despite the initial conservatism of some major forklift companies, we forecast that the market will enter a growth phase from 2023/2024 onwards. Around this time, all follower forklift companies will scramble to jump on the wagon, hoping to not be left behind as the industry begins to absorb some of colossal wage bill spent annually on human-provided driving services. In this process, many will rush to develop or acquire autonomous mobility technology without having to open their system to third-party retrofit providers. Most mobile robots- automated or autonomous- are restricted to transporting goods from A to B. They lack the ability to pick or grasp. This is because grasping is a challenging task in which humans hold a significant superiority. Many are however seeking to change this. In the traditional approach, a robotic arm would be hard programmed to follow specific instructions. This would work when grasping known and regular objects in a stationary, constrained or controlled environment. In the emerging approach, robots learn to grasp either though many trail and errors or by practising on a synthetic dataset. This way the robots can learn to grasp unknown or irregular objects in variable environments and even potentially from a mobile base. Indeed, using such deep learning approach, robots can now achieve success rates exceeding 93% when grasping novel objects. Companies are also trying to commercial this. Here, the initial focus is on regularly shaped objects such as boxes but will then slowly expand to other items. Our report suggests that mobile picking will get off to a slow start around 2020 and that adoption will accelerate in 2024. This phase of growth however will soon plateau waiting for the next leap in performance that will ultimately unleash an irreversible explosive growth. Delivery is a critical part of the logistics chain and automation is impacting all its step. First consider long-haul trucking. This is a productive step already in that large payloads are transported along fixed routes. Autonomous mobility technology can however improve on this. Today, drivers are, by law, required to limit their driving time to ensure safety. This means lower asset, i.e., truck, utilization or a higher wage bill in that two or more drivers may be needed for continuous driving. In the short term, partially autonomous mobility can provide the basis for the relaxation of this limitation whilst, in the longer term, full autonomy can significantly cut the wage bill industry-wide. Companies are already testing autonomous trucks on roads. Prior to eventual potential full (level 5) automation, the idea is that the machine can take over in long stretches of straight intercity roads while the human can resume control when approaching complex crowded cities and their boundaries. Our report forecasts that autonomous trucks (level 4) will be commercialized as early as 2022. Full level 5 autonomy however is unlikely to arrive prior to 2027. It will then continue its growth, surpassing annual sales of trucks with level 4 autonomy around 2032. Note that our report provides forecasts in units and value (with and without the cost of the truck itself). In contrast to long-distance on-ground delivery, the last mile is inherently unproductive. This is because small payloads must be delivered to customized routes. Therefore, it represents around 50% of the total delivery costs. Companies are now developing autonomous delivery robots, seeking to address this productivity challenge. These robots are small electrically-powered autonomous units carrying a light payload. They travel slowly and require recharging. The navigation technology is also improving and is still limited to close supervision in uncongested and structured environments. The robots are thus not as productive as other solutions such as man on a bike. The secret however lies in fleet operation. Unmanned autonomy enables a few persons to monitor a large fleet thus spreading the wage bill across many units. Our analysis shows that in the future, when the unit cost of such robots inevitably falls, they can become more productive at reasonable operator-to-fleet ratios. We thus forecast that last mile delivery robots will exit the learning (trial) phase from around 2023 and enter the rapid volume growth phase. This forecast may in fact prove conservative given the scale of activity already taking place globally including in China. Delivery drones are however a different story. The drone hardware has become commoditized, but it is still constrained by limited flight time and payload capability. Legislation and even autonomous mobility technology still keep the robots within extended line of sight. There are concerns over safety and further innovation are needed on how to deliver the item into the recipient’s hands. Therefore, despite all the hype, we do not anticipate significant commercial uptake in the medium run. In this time activity will likely to limited to delivering valuable items to remote destinations or between critical institutions like hospitals. For more information please refer to our report “Mobile Robots and Drones in Material Handling and Logistics 2018-2038“. It provides short-, medium- and long-term market forecasts in unit and value. It also develops technology roadmaps, clearly explaining the different phases of market growth. This report focuses on all aspects of mobile robotics in material handling and logistics. It considers automated guided vehicles and carts (AGVs and AGCs); autonomous mobile vehicles and carts/units; mobile picking robots; last mile delivery ground robots (droids) and drones; and autonomous trucks and light delivery vans (level 4 and level 5 automation).